This organic gift box is absolutely bursting with tasty Riverford treats to eat and drink, all handmade to our own recipes (except the fizz!). Rich, buttery mince pies, double chocolate brownies, crunchy almond cantuccini, Seville orange marmalade, plum and cranberry chutney, and a beautiful Christmas pudding. To drink, La Jara’s outstanding Prosecco Frizzante. 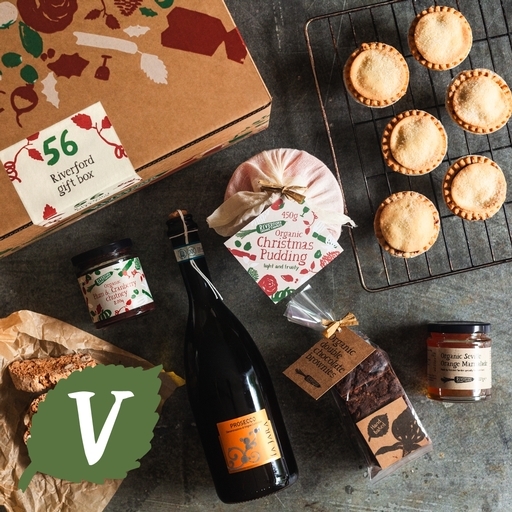 For more festive foodie treats delivered to your door, browse our online shop. La jara prosecco frizzante 75cl: Glera (Prosecco), Alcohol 10.5%, sulphites 107mg/l, produced in Italy, Suitable for vegans. Mince pies, almond cantuccini, Christmas puddings, chocolate brownies, marmalade and chutney are all made to our own recipes by The Authentic Bread Company, Crosbies and Kitchen Garden. Prosecco is La Jara’s finest. Double chocolate brownies: Chocolate (45%) (cocoa mass (67%), cocoa butter (7.9%), vanilla powder), butter (milk), sugar, eggs, self raising flour (wheat, raising agent (sodium bicarbonate*)), coffee. Small Christmas pudding: Sultanas, brown sugar, carrot, apple, self-raising wheat flour, breadcrumbs (wheat flour, salt*, yeast*), raisins, currants, butter (milk), sunflower oil, mixed peel (orange peel, corn glucose-fructose syrup, cane sugar, lemon peel, lemon juice), marmalade (raw cane sugar, oranges, lemon juice, fruit pectin), eggs, golden syrup, brandy, lemon juice, milk, nutmeg, cinnamon, mixed spice (coriander, cinnamon, ginger, nutmeg, caraway, cloves), grated lemon zest. Seville orange marmalade: Cane sugar, water*, Seville oranges (35%), lemons, produced using 35g of oranges per 100g. Almond cantuccini: Wheat flour (wheat, calcium carbonate*, iron*, niacin*, thiamin*), cane sugar, egg, almonds (10.5%), hazelnuts, candied lemon peel (lemon peel, glucose syrup*, salt*), candied orange peel (orange peel, glucose syrup*, salt*), orange zest, cream of tartar*, mixed spice, cinnamon, bicarbonate of soda*. Plum & cranberry chutney: Plums (61%), onions, raw cane sugar, cider vinegar, apple, cranberries (9%), dates, chilli purée, garlic purée, spices, sea salt*.